Heeeeeey! It's the first installment of Takeout Tuesday featuring Rice To Go. I realize I previously have had issues with fusion restaurants, but this is the one that proved me wrong. What you order is what you get EXACTLY(or better than) as you expected. They don't try to make some fancy version of the dish you really crave. Gotta love it! Rice To Go is located in a plaza with a small store front. It has minimal seating for those waiting for their food, so it's best to order ahead to avoid standing around. They are pretty quick and often have specials! 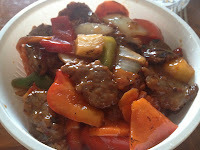 Pictured here is my favourite rice bowl, Mongolian Beef. The combination of fresh vegetables, sweet and spicy tender beef has me coming back. It was the first thing I tried there, so I have trouble trying other dishes! TIDBIT! Not in the mood for rice? They will replace the rice with udon noodles! My family orders them all the time! The food here is so fresh, I had to write about them. Everything is made to order, not ahead of time. They have a large menu, so I'm sure you'll change your mind 10 times before settling....but in the back of your mind, you've already got the dish picked out for your next visit! Not in the mood for cooking, but don't want to get out of your track pants? Pick it up or have it delivered.